For three days in a row Naomi Bueno de Mesquita organises mapping sessions in which my aim is to collectively map the dynamic use and performance of the old town square. Participants are asked to use an application for a mobile phone that is designed for this purpose. The tool in this app has several brushes incorporated, which is the legend of the map. Each brush represents a category of a kind of performance that takes place. This can be for instance officials, maintenance, adolescents, the dances of the segways, locals manoeuvring between the crowd, etc. It is collectively decided upon on the spot, which performers to map that are of interest for the moment of the day. The cartographic exploration consists of the following of these public performers one by one. That is, walking behind the person as close as possible with which each cartographer is able to leave a trace of the person on the digital map; a map that is collectively constructed over time. While mapping the traces, the cartographer is furthermore able to make pictures of places or moments of friction between different realities. This way two different maps are collectively constructed; a map of the traces of the public performers and a map of pictures demonstrating moments or spaces of friction. Understanding public space as a stage and the question who ‘the public’ or performer is, are explored and discussed. This project is part of the PQ Space Exhibition. Workshops will be organized twice a day at 10.30h and 15.30h from June 23 – 25. 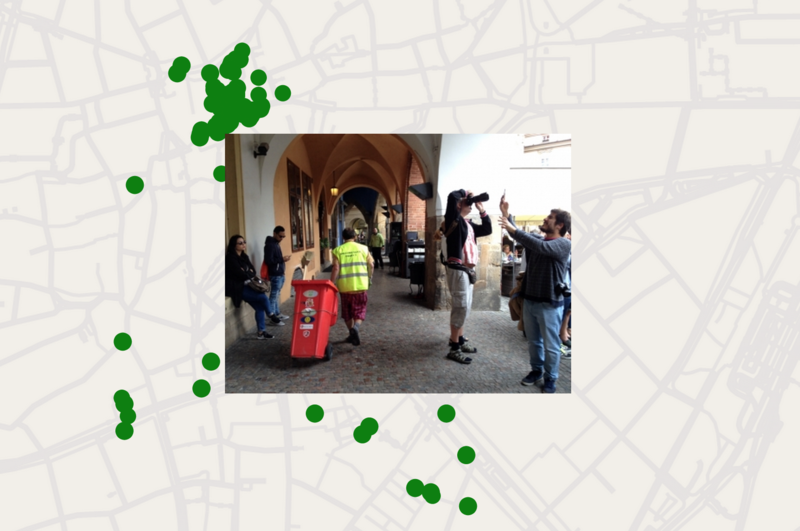 It is also possible to use the application and contribute to the mapping outside the workshop. For more information on how to download the app and work with it, come to the Publishing Room, the Dutch headquarters at Colloredo-Mansfeld Palace, and ask our host.